Here’s one for those of us who like to leap about like a lunatic on stage. Oh wait, we’re guitarists, so I guess here’s one for all of us, hehe. AKG today announced the introduction of the GuitarBug Transmitter, which provides superb audio quality and performance at a very competitive price. WMS 40 Pro is well known for it’s miniature transmitters and quality sound and the introduction of the GuitarBug is the next generation of wireless transmitters. The GB 40 GuitarBug offers a user-friendly interface that has the ability to turn a guitar, bass, or portable keyboard into a wireless instrument. The FlexJack swivel jack plug will co-exist with any type of output jack and is spring loaded to hold the GB 40 securely against the instrument. 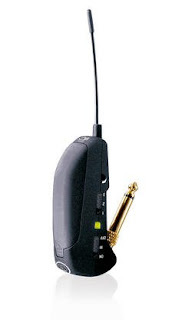 In addition, the diminutive size of the GB 40 makes it virtually invisible and will not interrupt the musician’s ability to effectively perform with the transmitter in place. Additionally, the GB 40 is placed on top of the instrument’s output jack allowing the musician to easily control the noiseless on/mute/off switch and gain control. The GB 40 Flexx will be available as single version and as “guitar-set” version with a stationary receiver SR 40 Flexx. For more information, visit their web site at www.akg-acoustics.com. The Michael Kelly Guitar Company has upgraded the Hex Deluxe and Vex Deluxe for 2009, adding new active Rockfield pickups. I kinda dig the Hex, with its dark smoky colour and that reverse headstock, but the Vex looks a lot like a Schecter to me, and there are an awful lot of twin-humbucker, string-thru, flamed-maple, abalone-bound guitars out there. For a long time EMG had the whole active pickup thing stitched up, but Seymour Duncan’s Livewires are giving them a serious run for their money at the moment. Even Ibanez introduced their own active pickup last year on the ART300 and ART400 models. Perhaps these new Rockfield pickups are further evidence of the active market opening up. Michael Kelly Guitar Company has announced new versions of its popular Hex Deluxe and Vex Deluxe double cutaway models. The featured upgrade for 2009 is the addition of a scorching new set of active pickups. The Deluxe twins are the first guitars on the market to come equipped with Rockfield Pickups new Black Betty active humbuckers. “Consumers were asking us for a specific tone and performance level for the modern music environment. When Todd Rockfield shared these new pickups with us, we instantly knew that these exactly matched what our users had been asking for,” explained Tracy Hoeft, the company’s founder. Another key feature on the Hex Deluxe and Vex Deluxe is their set-thru-body construction. This construction provides the great tone of a set-neck instrument with the added access provided by a neck-through-body construction. Both of the Deluxe models have 24 frets, a custom inlay design, Grover tuners and exotic wood options. The Hex Deluxe boasts an original Floyd Rose tremolo while the Vex Deluxe has a string-through body design and a fully carved top. CLICK HERE to buy the Ibanez ART300 from Music123. CLICK HERE to buy the Ibanez ART400H from Musician’s Friend. CLICK HERE to see eBay pickups on eBay. There’s another Kerry King V on the way. Jeff Hanneman was always my favourite Slayer guitarist but it seems Kerry’s the one who got bitten by theh the endorsement bug (although check out Jeff’s ESP signature guitars). The hundreds of thousands of people that have seen Kerry King on stage with Slayer recently have seen his Generation 2 graphics. This new striking tribal design is floating over a hand drawn flame making it visually striking. Now B.C. Rich is bringing this great new graphic to a new production model called the Kerry King V2. The body shape is the aggressively styled B.C. Rich speed V and it has been augmented with many Kerry King inspired features. The V2 model is equipped with B.C.R.A. active pickups and a genuine Kahler tremolo. It also features a basswood body, bolt-on construction, ebony fingerboard, special inlay and a Beast headstock. The 24 jumbo frets provide 2 full octaves of notes to shred. For more information, visit their web site at www.bcrich.com.